The Frozen Bouncer is Hot! 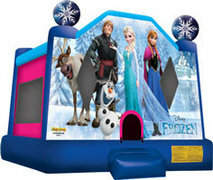 Description: Our licensed Frozen large bounce will make you feel like you're in Arendelle celebrating with royalty! The beautiful design features our favorite sister-duo-- Princess Anna and Queen Elsa, and of course their favorite snowman sidekick, Olaf! Also on the front panel, you'll find Kristoff and his trusty reindeer pal, Sven. Atop the infltable are two giant snowflakes, likely created by Elsa herself! The Frozen Large jump is the perfect way to combine fun and healthy activity, and will add value to any kids celebration or Princess Theme Party! Party guests will rule this bouncy house kingdom, with plenty of room for bouncing fun all day long.